Buying a vehicle can be confusing, especially when it has been owned before. Many of us have no idea what to look for when trying to decide if a car is a good buy or a lemon. My dad, along with Bob Caylor of The News-Sentinel, created this video article to help you navigate the seemingly complex prepurchase maze. Over 1/3 of drivers (37%) have sent or received text message while driving, and 18% said they do it regularly. Results of the poll showed that younger drivers were more likely to engage in distracted driving. Men were more likely to drive while drowsy, drive after drinking, read a map, use a GPS system, and use the Internet. Another statistic worth noting, about 6000 deaths and a half a million injuries are caused by distracted drivers every year. So we know that distracted driving is dangerous, to ourselves and others, but what can be done when a common day requires timely responses to text messages, emails and tweets? This app automatically turns on when the vehicle is gong faster than 10 miles per hour. Once the car reaches 10 on the speedometer, the keypad on the cell phone is blocked, so that driver can’t read text messages, send a text or surf the web. Once the car slows down to below 10 miles per hour, the app turns back off. It will also send an automated response to whomever texted you explaining that you are driving- a message that you can customize. You must turn this app on when you get in your car. Once turned on, the app makes sure that you don’t get phone calls, text messages, emails, etc. Once you turn the app off, all of your texts and phone calls you may have received while driving show up on your phone. The app also features a customizable automated response that will be sent to those who have contacted you while you were driving. During the extreme summer temperatures most people really don’t think about what the weather is doing to their car. The heat and humidity plays a big role in how various systems and functions of a vehicle operate, such as fluids, belts, hoses, and even the tires. The high temperatures will be of a higher risk to automobiles that are not properly maintained, or have had the routine maintenance put off maybe a little longer than they really should have. First thing to be sure of during the summer heat is to keep up on those oil changes. Maybe you’ve put your oil change off a little longer than you should. Ok, no big deal right? Wrong! What happens as the temperature rises, the oil viscosity becomes lower, meaning the oil in you cars engine is thinner and not providing as much protection as when it is operating under normal circumstances. So now that you have oil that isn’t as working as well as it should, combined with the fact that your overdue on that oil change, your heading for big trouble in the future. Old broken down oil that no longer has the lubricity it needs to protect your engine will create higher friction in your engine, causing more heat. All that on top of the heat outside will create big problems for your engines internal components. So next time you say to yourself , “Oh, I am only a few hundred miles overdue on my oil change” we remind you, think twice, and assure yourself that it won’t cause you big problems in the future. Along with regular oil changes a knowledgeable auto repair facility should monitor regular maintenance items on your vehicle, such as belts and hoses. These products constructed of mostly rubber are another area of an automobile that will require a little more attention during the months of higher temperatures. The coolant hoses are more likely to expand and split during the extreme summer temperatures. Your vehicles belts are constantly moving with the revolutions of the engine, so if your belts are older, or worn out there is a chance that they may have stress cracks in the rubber. These tiny cracks will have a greater chance of splitting apart in the heat when the rubber gets very soft. It’s a good idea to monitor them, and have them replaced at your manufacturers recommended intervals to avoid them breaking as you are driving down the road. Along with the belts comes another system run by a belt that we do not want to break in the summer, the air conditioning. Our cars air conditioning system is greatly affected by the heat and humidity. You may notice when it gets close to 100 degrees outside your air conditioning may not be as cold as it was when it was around 80 degrees. Do not be alarmed if this happens, its just that the system can not work efficiently in the higher temperatures. A few tips to get that air as cold as you can is if your car has the option to either re-circulate the air then you should use that. You will use the already cooler air in your car as opposed to drawing in the hot air from the outside of the vehicle. Another tip to keep that car and the air conditioning cool is to keep the vehicle in motion. As your vehicle travels you will keep air flowing thru the engine and the air conditioning systems condenser, making the system work more efficiently. Last, but certainly not least, the tires. Maintaining your vehicles tire pressure is very important. If you still have your tires filled with air, versus nitrogen, then the air will change pressures with different temperatures. That being said you have to take into consideration the temperature of the pavement your driving on is higher than that of the temperature of the air. With your tires constantly moving on hot pavement, it is making the pressure in the tires increase. A great way to solve this problem is to have your tires inflated with Nitrogen instead of air. Nitrogen is not as affected by temperature change as drastically as air is. This helps keep your tire pressures closer to where they should be, and not greatly fluctuating with the temperature outside. Keep up on your vehicles regular maintenance and it will treat you much better when the temperature outside is harsh on you and your car. A little preventative maintenance now will give you peace of mind when the weather becomes drastically hotter. The last thing you would want is to be stranded on the side of the road in the heat with either an overheating car, or one that will not run at all. You don’t want to be left without air conditioning when the temperatures are extremely high! Opinions of technology’s place in our world vary. Some people believe that although we have the ability to utilize technology to assist us in our lives, that less is more. Others welcome technology in anyway which makes our world easier and or a safer place to live. I personally believe that the answer lies somewhere in between these two extremes. I believe that many of these advancements are good adaptions, but some of them are a needless expense and with a little more education on proper care maintenance, these adaptions could be avoided. Here is an example of one piece of technology which could help us greatly. One thing that concerns me is that there is no mention of any cost to the consumer for this type of technology. I would be interested to learn more. What do you think about this? I’d love to hear!! Electronic vehicle-to-vehicle communication technology could eliminate or reduce most crashes, Consumer Reports says. 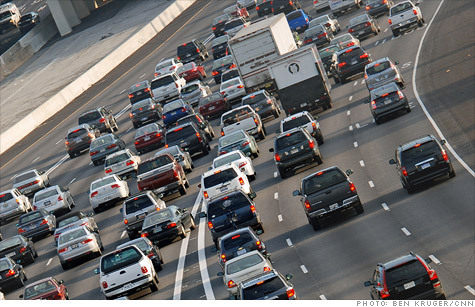 NEW YORK (CNNMoney) — Consumer Reports magazine announced its support Tuesday for so-called vehicle-to-vehicle technology, which will allow autos to communicate with each other electronically — and potentially save thousands of lives. Vehicle-to-vehicle communication, or V2V for short, allows cars and trucks to communicate with other vehicles in a given area. Each vehicle broadcasts its own speed and direction, making it easier to avoid potential collisions. A vehicle could even send out an alert as its wheels begin to skid, alerting vehicles behind it to a slippery surface ahead. V2V is often discussed as a potential component of future “driverless cars,” but it can also be helpful in human-driven cars, providing an adjunct to a driver’s own eyes and ears. In some situations, the data could be used to automatically take action, such as braking, if a driver fails to heed a warning. The technology has been under development by major automakers for years. The Department of Transportation’s National Highway Traffic Safety Administration is expected to rule next year on moving forward with research into the technology. V2V technology could help drivers avoid or minimize about 80% of crashes involving sober drivers, according to NHTSA. The systems can also be used to communicate, not just with other cars, but with things such as street signals and signs, allowing cars to react automatically to red lights or school zones. The devices used for this technology can be small, about the size of a cigarette pack. Older cars could be easily retrofitted with V2V devices, said Nady Boules, director of electronics and controls for General Motors (GM, Fortune 500). In the future, the technology could even be incorporated into cell phones, said Boules. That would allow pedestrians to carry devices that could warn car and trucks as they step into the street. While a V2V system’s effectiveness would increase with the number of equipped vehicles, it could be helpful even with relatively few equipped vehicles, Consumer Reports said. Addressing privacy concerns will be important, however, the magazine said. “Adequate oversight of how the information is used is essential to ensure the privacy of drivers and to prevent abuse,” said Rik Paul, automotive editor of Consumer Reports. 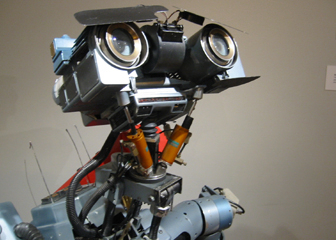 Ever since I saw Johnny 5 in Short Circut as kid, robotics has been a pet interest of mine. Just the idea that it was possible to create something that was responsive to it’s environment was so interesting. Like most kids, I didn’t quite understand the difference between fantasy and reality- I thought that maybe someday I could have a Johnny 5 of my own. And I have to admit, being an only child, the idea of having a constant playmate sounded pretty cool. As I grew up, cars also became an interest of mine. I suppose that is a little odd for young girls, but considering I grew up around cars, technicians, and was pretty curious… it makes sense that I would want to make sense of all the jargon that surrounded me. So you can imagine my excitement when I saw Tom Vanderbuilt’s article in Wired Magazine dealing with automated vehicles that drive themselves! Although they don’t talk or have a cute face like Johnny, they are still really cool technology and I couldn’t wait to share it with you! Even if self driving vehicles seem scary versus exciting, I still recommend that you take time to check out this article. Afterall, it’s good to know the latest advancements and what might be coming around the corner for us mainstreamers. Do you know when it is time to change a timing belt? The answer depends on the type of vehicle you have. The right time to change a timing belt is upon reaching the mileage interval specified by your vehicle’s manufacturer. In most cases, this is usually between 60,000 and 75,000 miles. The exact mileage interval for changing your timing belt is usually specified in the owner’s manual. If you can’t find the owner’s manual, you can call and ask the service department of any dealership that sells your make of vehicle. They will know when the timing belt of your vehicle should be replaced. 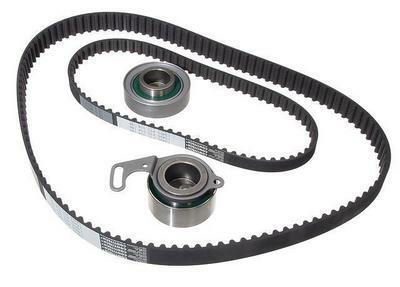 A timing belt is a ribbed band of rubber and fiber that controls the timing of your engine’s valvetrain. It connects the crankshaft with the camshaft and it is necessary for the operation of your engine. If your timing belt breaks, you’ll be going nowhere fast. Timing chains are more durable than timing belts but timing belts don’t need lubrication, are quieter, and cost less money. This is why most vehicles nowadays use timing belts. The downside to timing belts though is their limited life span. There are usually no indications of their impending failure either. They simply break or come off while you are driving and leave you stranded. In some engines, serious valvetrain damage can occur when a timing belt fails and this can be very costly to repair. Therefore, it is absolutely crucial to follow the timing belt replacement schedule recommended by your vehicle manufacturer. Doing so will save you a lot of headache down the road. When anyone asks me about when to change a timing belt, I always give them the same advice: an ounce of prevention is worth a pound of cure. Keep that in mind and happy motoring! Vehicle identification numbers, more commonly known as VIN’s, are used for a variety of reasons. Their primary purpose is to identify motor vehicles but they are often used to track other things such as registrations, insurance coverage, and even parking tickets. Decoding the VIN of your own vehicle will probably not yield any surprising information but if anything, vehicle identification numbers can be helpful in discovering important facts about a car you may want to purchase. There are many companies in the business of providing vehicle history reports, such as CarFax.com, and these valuable reports are all based on that magical and mysterious code known as the VIN. Before 1980, there was no industry standard for vehicle identification numbers. Nowadays, auto manufacturers use 17 digits in total to give a VIN number meaning. Different combinations of numbers and letters are used (except the letters I, O, and Q) to represent specific information about the vehicle. 1. The first three digits of a VIN are known as the World Manufacturer Identifier (WMI) and these digits simply identify the manufacturer of the vehicle. Some automakers use the third digit though to identify subdivisions or particular brands. This is common to GM and other large auto manufacturers. 2. The fourth through ninth digits are known as the Vehicle Descriptor Section (VDS) and identify the model and the body style. The ninth digit though is almost universally used as a check digit. A check digit is a single letter or number used to verify the accuracy of the vehicle identification number transcription. 3. The tenth through seventeenth digits are known as the Vehicle Identification Section (VIS) and identify various characteristics of the vehicle, such as the plant where it was built, its options, and in what order it came off the assembly line. Since there are endless permutations of VIN codes, the best way to decode the VIN of your own vehicle is to use a VIN decoder. There are many free VIN decoders available on the Internet. You can use any search engine to find one and once you have done so, you simply input the VIN of your vehicle and its unique information is then displayed for your review. The meaning of a VIN number is fairly uninteresting to most people except employees of your local DMV, law enforcement personnel, and die-hard car collectors. The DMV will use your VIN to maintain a detailed record of your vehicle and issue you ownership and registration documents. Law enforcement personnel usually use VIN’s in the course of vehicle theft recovery and prosecution. Die-hard car collectors use VIN’s to identify rare and/or valuable cars and their special features. A VIN is usually a small, rectangular metallic plate that is attached to the driver’s side of the dashboard, near the bottom of the windshield. Vehicle identification numbers can also be found on major components of a vehicle such as the engine block, chassis, and transmission. Imagine you’re in your car driving home from work, or driving to the grocery store. The weather isn’t particularly bad, the road conditions are fine, and you’re singing along with the radio. Then out of nowhere, a car makes an illegal turn, winds up in front of you, and you don’t have time to stop. You hear the screech of metal as your car collides with the other, and brace yourself to go flying through the windshield. Instead, you are pushed backward into your seat, held there for a split second, and then the pressure subsides. Your seatbelt was the first line of defense but you are upright in the driver’s seat because your car is equipped with a vehicle airbag. Twenty years ago, when vehicle airbags were first being offered, many people joked about how they functioned. Some likened them to stove-top popcorn, of the type that started out looking like a pie pan and ended up looking like a lumpy silver balloon, while others thought they were just really big balloons. Either way, most people thought and many people still think that once an airbag inflates, it remains inflated leaving you cheek to cheek with talcum coated nylon until help arrives. 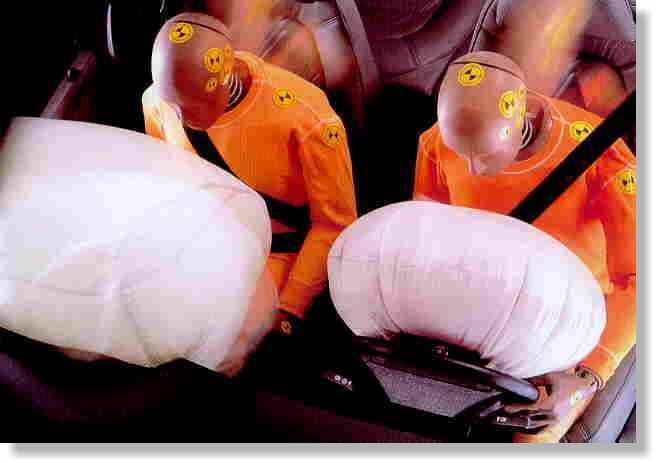 In reality though, how airbags work is by decreasing the momentum of the driver and passengers within a car to zero. It’s a direct relation to the old physics statement about objects in motion remaining in motion; when your car collides with another, the car stops moving but without an airbag and your seatbelt (they’re designed to work together) you would keep going forward. To make matters more difficult, this momentum must be stopped in less than a whole second and only the space between the driver and steering wheel or passenger and dashboard is available for this to happen. 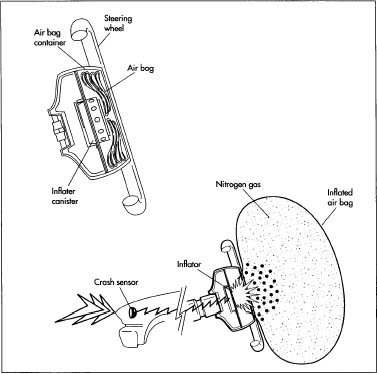 There are three main components of an airbag, all integral to their function. They are the bag, the sensor, and the inflation system. Airbags are constructed from a fine gauge of nylon and then folded into the steering wheel, dashboard, the door panel or sometimes, the roof rails above the door. This is the mechanism that tells the bag it’s time to inflate, which generally requires the equivalent force of running into a brick wall at 10 – 15 mph. Sensors in newer airbag systems are designed to determine whether or not there is a person in the front passenger seat and whether or not the passenger has enough weight for the bag to be safely deployed. The inflation system of an air bag is usually a combination of potassium nitrate (KNO3) and sodium azide (NaN3) which combine to form nitrogen gas. Hot discharges of this gas inflate the bag at a speed of roughly 200 mph. Immediately after inflation, the gas is dispersed through tiny holes in the air bag, which causes it to deflate. The entire process takes about 1/25 of a second. Cornstarch or talcum powder is generally used within the storage system for airbags to keep everything flexible and stick-proof. Airbags were originally designed to be used as a seatbelt replacement system. Ford actually produced cars with an early version of the technology in the 1970s but the modern version of the bags didn’t come into wide use until the late 1980s. It wasn’t until the mid-1990s that at least two airbags were standard in most cars. No longer marketed to replace seatbelts, it is now understood that airbags work in tandem with safety belts to keep drivers and passengers inside a car, and in an upright position, during a collision. The use of a seatbelt however is still the most important aspect of automobile safety. 1. The ideal distance is 10 inches between your breastbone and an airbag. Smaller distances can cause impact injuries when the bag is first inflated. 2. Smaller adults (under 5′ 4″) and children may be safer riding in cars with the passenger seat airbags switched off, in order to avoid injuries to the face and neck during a collision. 3. Children in backward-facing infant seats should never be placed in a front seat with the airbag engaged; their heads are too close to the bag. Modern vehicle airbags are much safer than the originals from the 80s and 90s, and now do more than just protect passengers from front-impact collisions. Current systems include special protection for the head and neck, and some will help cushion and restrain the driver and passengers if the vehicle should roll over. The best hope, of course, is that you are never in a collision with enough force to cause harm but if you are, be glad that vehicle airbags are required by law in all new cars sold in the United States. In European markets, they are still considered optional features.